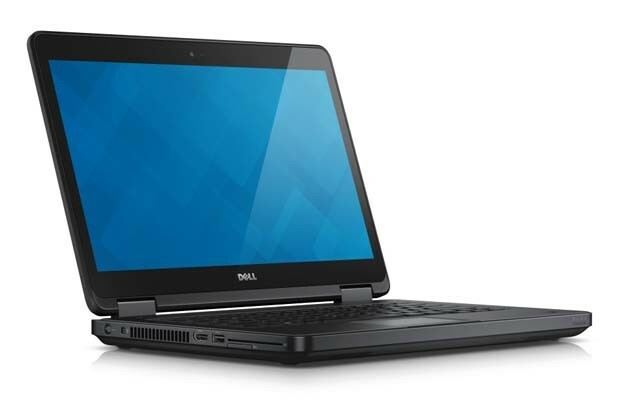 Model: The Dell Latitude E5450 is a budget friendly laptop built for business usage. Typical Dell there are many configuration options. This model uses an Intel Core i5 4310U processor of the 4th generation with integrated HD Graphics 4400, 8 GB RAM, and a 128 GB SSD from Liteon. The CPU options range from an Intel Celeron processor up to a Intel Core i7 ULV processor of the 5th generation. The available integrated GPU depends on the processor. Optionally, you can configure a dedicated Nvidia Geforce 830M or 840M graphics card. This model uses a matte 14-inch Full HD display. Available options are HD resolution or FHD Touch with Corning Gorilla Glass NBT. There are three battery options and this variant uses a 51 Wh lithium polymer battery, which makes for a battery life of up to 14:30 hours according to Dell. The connectivity includes three USB 3.0 (one with PowerShare), HDMI, VGA, and a LAN port (RJ-45). Wireless networking is possible via WiFi and Bluetooth 4.0. In addition, this variant comes with the optional Qualcomm Gobi 4G LTE Wireless Card for mobile broadband and an optional fingerprint reader and an optional smartcard reader in addition to the standard lock slot as security features. 4310U: Haswell-based ULV dual-core processor clocked at 2.0 GHz with Turbo Boost support. Offers an integrated HD Graphics 4400 and a dual-channel DDR3 memory controller.» Further information can be found in our Comparison of Mobile Processsors.